The vendor landscape of the global market of hematology diagnostics features a handful of companies collectively accounting for a large share in the overall market, hinting at a largely consolidated vendor landscape, observes Transparency Market Research in a recent report. Companies such as Sysmex Corporation, Abbott Laboratories, Beckman Coulter, Inc., F. Hoffmann-La Roche Ltd. command dominance owing to their expansive product portfolios and well-established distribution channels globally. To gain a larger hold on the market through more diverse product portfolios as compared to their peers, companies are resorting to strategic partnerships. Case in point is Abbott’s October 2017 acquisition of Alere Inc., a leading diagnostic services and device provider. Other leading companies in the market are Siemens Healthineers, Bio-Rad Laboratories, Inc., Danaher (Beckman Coulter, Inc.), Mindray Medical International Limited, HemoCue AB, and HORIBA, Ltd. 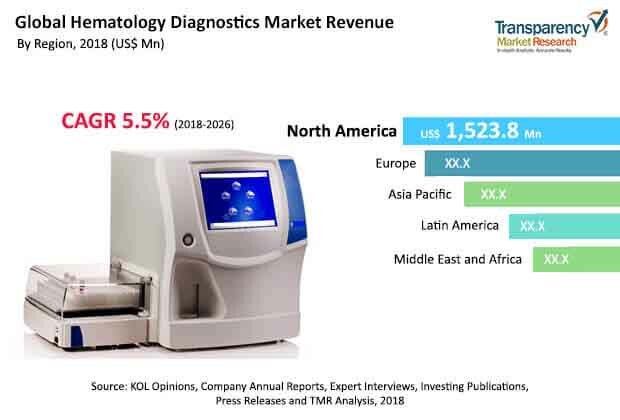 According to the report, the global hematology diagnostics market will exhibit a healthy 5.0% CAGR over the period between 2018 and 2026. The market had a valuation of approximately US$3,495.0 mn in 2017 and is anticipated to rise to a revenue opportunity of US$5,586.4 mn by 2026. Geographically, the markets in Europe and North America are presently the leading contributors of revenue to the global market, chiefly owing to the high prevalence of blood disorders, high awareness regarding available screening methods for blood-related conditions, and high expenditure on healthcare and wellness. Of the key hematology instruments examined in the report, the segment of hematology analyzers presently accounts for the dominant share in the overall market, thanks to the increased adoption of fully-automated hematology analyzers for more accurate results and reduced turnaround times. The chief factor to have helped the global hematology diagnostics market achieve vast stride in terms of technological advancements and introduction of new product varieties at a steady pace in the recent years is the vast rise in focus on the effective diagnosis of the rising cases of blood disorders in developed as well as developing economies. Studies show that blood cancers such as leukemia, lymphoma, or myeloma affected nearly 172,910 people in the U.S. alone in 2017. Cases diagnosed with these cancers are likely to have held a nearly 10% share in the estimated 1,688,780 new cancer cases diagnosed in the country in 2017. Moreover, nearly 1,290,773 people are either in the remission form or are living with myeloma, leukemia, or lymphoma in U.S. Increased awareness and understanding regarding these conditions among healthcare professionals as well as patients have also led to the increased adoption of hematology diagnostics devices over the years. Apart from this, the increased adoption of point-of-care-testing methods, technological advancements leading to more accurate results and easy-to-use devices, and the easy availability of a vast range of tests are also likely to drive the hematology diagnostics market. However, the market could face headwinds in the form of low awareness among population in developing economies and the high cost of advanced and automated instruments.